Guess what? It might be Monday, but I’m over on the MFT blog. They’re changing up things so I might be on Mondays from here on instead of Thursdays. 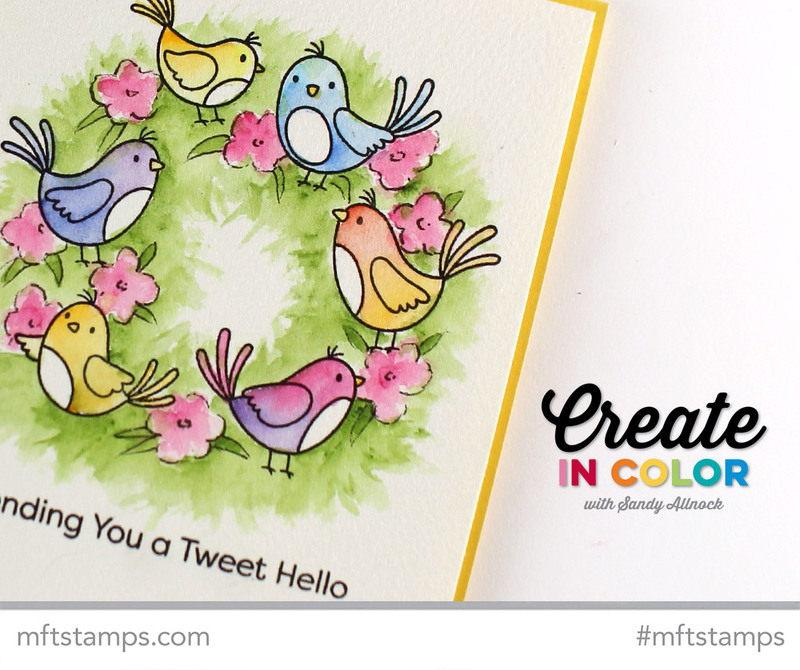 Go see how to paint this “tweet” little wreath! Those on my Art-Classes email list got a heads-up on signing up….but you get to hear about it today! I have TWO classes launched on painting and coloring skies and clouds – one in Copic, one in Watercolor. A discount for everyone on these classes, lasting through April 22nd! I am excited to let you know there was a little Easter miracle…my book finally showed up on Amazon and Barnes and Noble!! I waited all through March, and on the last last last evening…it was there. With the wrong photo and title – ha! It’s partially changed in some places, but…I’m celebrating anyway while they figure it out and get it all fixed! Book website is HERE! While I know the non-Bible-journalers may be disappointed in the book topic…please know I’m going to be keeping up my regular blogging and cardmaking and art stuff! You’ll have to put up with an occasional “squee” from me about the book, but you’ll get the regular content you come here for. Don’t abandon me, okay? Love you guys!! Big, big, big congrats on the book! How exciting! Gorgeous wreath card too! Love your gorgeous card thank you. Congratiolations with your book, I am an non-Bible person, but I love to look what beautiful art you make in your Bible. I atmire the way you translate a story in to a artwork, it always makes sence together. I also can imagen that religious people put strenght, love ore anything else from Bible Journaling. I don’t think that enyone would abandon you for occasional “squee” from the book and if they do so, they don’t derserve to look at your beautiful art. congratulations on your magna opera! No, I’m not a Bible-journaler, but I’m excited for you none-the-less. I come from an old publishing family, so I know getting your stuff published AND available through a major online soyrce is HUGE. Congrats on the book. No I will not abandon you, you have the right to be excited about your book and should shot it from the rooftops, on your blog, walking down the street, etc. Wonderful card as always. A beautiful wreath Sandy and CONGRATULATIONS on your book! I am not a Bible jouranaler (not because I wouldn’t like to) but because I am not good enough to attempt it and I have a FEAR of defacing a Bible! EEP! (I don’t mind watching you do it, I actually enjoy that as well!) However, I do continue to learn and gain confidence by watching folks like you and trying out what I see. You can rest assure that I will NOT abandon you. I love your bird wreath, I prefer the leafless flowers myself. Although I don’t do Bible journaling, I have loved seeing your creations and the inspiration behind them. So, you’re stuck with me even if I don’t comment often. Abandon you? No way! I’m not a Bible journaler but can still enjoy the art that goes into it. I’m not a Copic colorer either but I still enjoy watching the process! It’s ALL good stuff and I get so much inspiration from your posts even if I don’t choose the medium you are using.